A discussion of potential policy responses that emphasise the value of investment but also recognise the damage of tax avoidance. 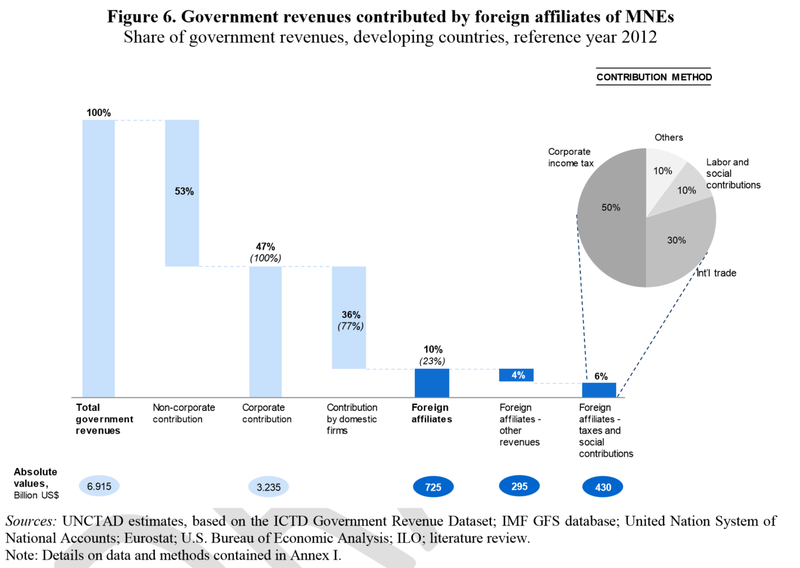 The first major element of the paper consists of creating a baseline for the revenue contribution of (the foreign affiliates of) MNEs, drawing primarily on the ICTD Government Revenue Dataset. The authors break down the pattern of revenues overall (figure 3 – click for full size), and then focus on the contribution of MNEs. 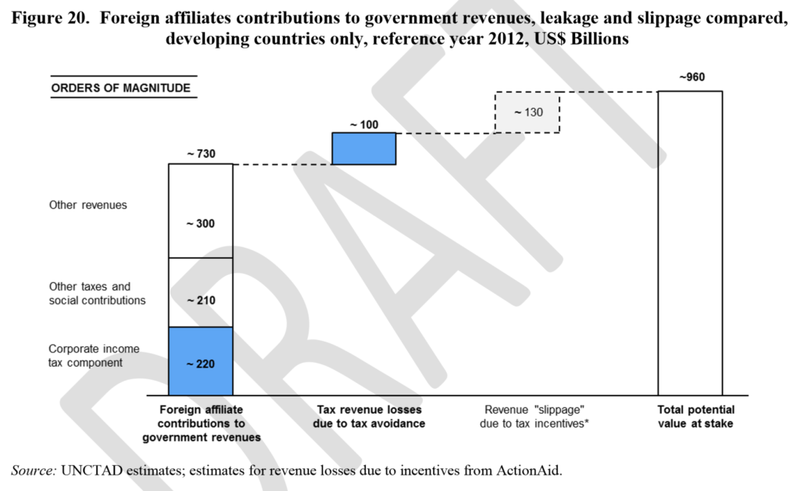 Figure 6 shows the results of the ‘contribution method’, where each component of revenues is decomposed into a corporate and a non-corporate element, and the former again into a domestic and foreign affiliate element (see Annex I for full details). This allows an overall estimate of the contribution of MNEs’ foreign affiliates, of around $725 billion or 10% of total revenues. Around 3% of revenues derives from MNEs’ corporate income tax. 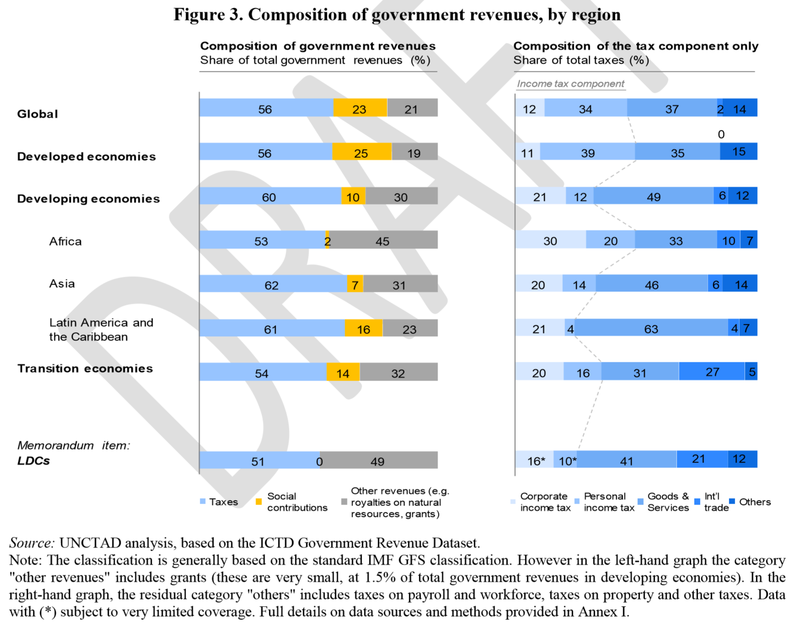 As a cross-check, the authors use balance of payments data to construct the ‘FDI-income method’ which involves estimating the total revenue contribution from both corporate income taxation and non-income items. Per figure 7 (click to enlarge), this yields an overall contribution of $730 billion. There is perhaps more uncertainty in this approach, since it rests on the estimated tax rate and on the extrapolated rate of other (non-income tax) revenue contributions. Nonetheless, the full approach (again detailed in Annex I) is plausible, and the cross-check on the contribution approach is valuable. The second contribution of the study is to assess the (jurisdiction) sources of investment. 42 jurisdictions are identified as either ‘tax havens’ (“small jurisdictions whose economy is entirely, or almost entirely, dedicated to the provision of offshore financial services”) or ‘SPEs’ (jurisdictions offering SPEs or other entities facilitating transit investment. 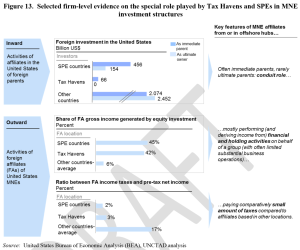 Larger jurisdictions with substantial real economic activity that act as major global investment hubs for MNEs due to favorable tax and investment conditions”). This might be considered a rather blunt approach; as I’ve written elsewhere, there are serious issues with any ‘tax haven’ definition, and the intuition of the Financial Secrecy Index is that it makes more sense to think of jurisdictions on a spectrum, rather than being either ‘havens’ or not. Nonetheless, it’s clear that the approach here identifies the major players one way or another. Figure 13 (click to enlarge) shows the specific picture in the US. The difference in relative tax rates is striking: averages of 3% (‘tax havens’) and 2% (‘SPE countries’) versus 17% elsewhere. In this light, the growth in use of these conduit jurisdictions for investment in developing countries which figure 17 illustrates is of clear concern. 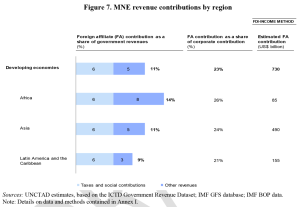 The logical next step of the paper is to consider the likely effect of using conduit jurisdictions for investment into developing countries on MNEs’ revenue contribution. It seems inevitable that this calculation will draw the most attention. “an additional 10% share of inward investment stock originating from offshore investment hubs is associated with a decrease in the rate of return of 1-1.5 percentage point” (p.34). Extrapolating to all (non-haven) developing countries generates a range of revenue loss estimates from $70 billion to $120 billion. Figure 20 shows the central estimate of $100 billion in revenue losses: towards half of the actual tax paid. The $100 billion is also around a tenth of the ‘potential value at stake’ – in effect, the total development finance associated with the activities of MNEs’ foreign affiliates. As an earlier draft had noted, the leakage of development resources is not limited to the loss of domestic fiscal revenues but it also affects overall GDP (as the profit component of value added is reduced) and potentially the reinvested earnings component of FDI. As companies shift away profits from the recipient country they may also undermine the development opportunities related to reinvestment of those profits for productive purposes. Applying an average reinvestment rate of 50%, for example, to the calculated (after-tax) profit shifting of $330 – $450 billion would yield lost reinvested earnings in the range of $165- $225 billion. Summing up the revenue loss component and the reinvested earnings component the total leakage of development financing resources would then be in the order of $250 billion and $300 billion – in other words, between a quarter and third of the potential value at stake. The pot of gold, however, should not be overstated: although this is likely to be a lower bound, since it does not capture all forms of corporate tax reducing behaviour, we’re talking about something like 1.5 percent of developing country government revenues on average. The absolute amount involved is clearly worth pursuing, and can have a substantial benefit in revenue terms and beyond; but the tax justice agenda cannot be boiled down to this alone. Much broader improvements, with both domestic and international components, are required to achieve a step change in effective taxation for development. The study concludes with a range of policy recommendations, focused on improving the sustainable development impact of investment into developing countries. These are summarised in figure 21. Multiple measures are set out, each worthy of more detailed discussion. A particular strength is the clarity of intent to ‘Ban tolerance or facilitation of tax avoidance as a means to attract investment’. If such an aim could be made operational and effective, it would imply an end to ‘competition’ among jurisdictions to take the tax base arising from economic activity elsewhere, of the type so clearly exposed in LuxLeaks. I would have liked to see more emphasis on transparency measures – including, crucially, public country-by-country reporting – that would not only make the analysis here much more of a calculation and less of an estimation, but also provide an ongoing tool for accountability to ensure progress in reducing avoidance. The UNCTAD study marks a major step forward in our understanding of the scale and nature of multinational tax avoidance in developing countries. Both the baseline for multinationals’ revenue contribution, and the assessment of the losses to avoidance, are likely to become part of the literature and the policy discussion for a good time to come. No doubt some of the approaches will be challenged, including the regression results (when aren’t they? ); and data will evolve over time (for example, the updating of the ICTD dataset in a few months’ time). But the pioneering approaches in the contribution method and the FDI-income method, as well as the model for the avoidance estimate, are likely to endure. The policy recommendations are likely to have influence, perhaps including in the FfD process, and provide a valuable reminder of the importance of maximising not investment, nor revenues, but the development benefits that result. Better tools to resist avoidance will improve the ability of governments to make any necessary trade-offs. This entry was posted in Follow the Money, tax and tagged BEPS, financial secrecy, FSI, international tax, post-2015, tax by Alex Cobham. Bookmark the permalink. I find the idea of thinking of profits taken out of the country as a loss to that country, worrying. Compared to what? Compared to a domestically owned firm, maybe. But investments by multinationals don’t crowd out domestic investments, and if the whole process of FDI is a net gain to the economy, it is perverse to regard fact that those who put investment in want to take profit out, as a loss to the economy. reminds me of that gag, the only thing worse than being exploited by a capitalist, is not being exploited by a capitalist. Similarly, I do not understand what’s behind these reinvestment calculations. When an MNE chooses to invest in a country to begin with, it does so with money it did not earn in that country. Why should subsequent investment decisions have anything to do with where profits are recognised? For example if a country A generates lots of profit that can be entirely shifted to country B to avoid paying any taxes in A, why would that inhibit further investment in A? Yes unless I have misunderstood method, it suggests that taking profit out of A somehow represents lost investment in A.
I may have completely misunderstood what I have read. Thanks Paddy. That rough estimate on reinvestment just reflects the observed ex post average reinvestment of around 50% (so I’m told; I don’t have a source to link to), which in turn contributes to a broader picture of foregone development finance if you assume that profit isn’t somehow shifted back for reinvestment once it’s been shifted out for tax avoidance. I’m not aware of any studies that address this though, so I wouldn’t take it too seriously (and that’s probably why it dropped out of the final draft). It would be interesting to hear your thoughts on the estimates in the paper. Thanks for the summary. 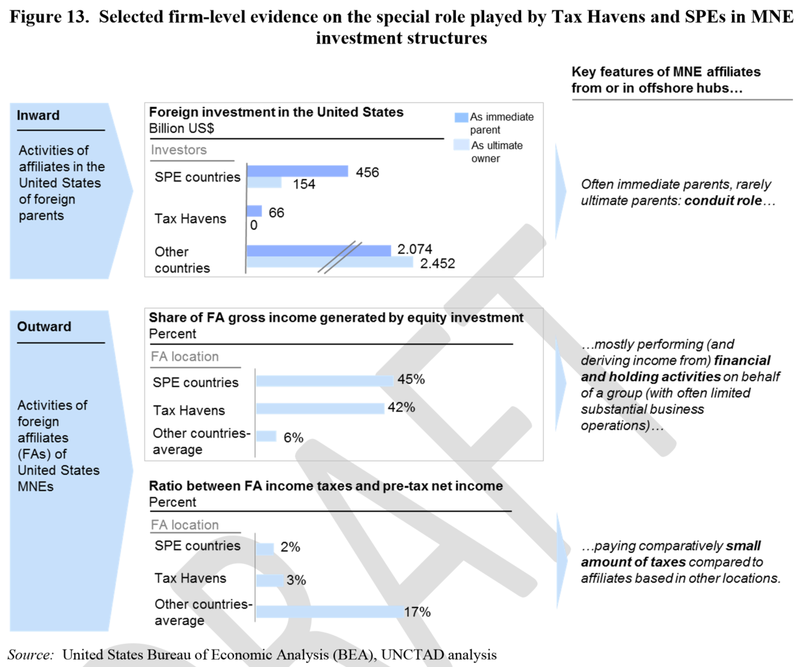 This report looks really interesting – it is not just another $100 billion estimate, but locates the tax avoidance estimates within the wider context of economic fundamentals of investment, and overall tax revenues. I have to agree with Paddy on the reinvestment calculation you add – viewing returns to foreign investors as ‘foregone development finance’ is perverse, and does not seem to chime with reality … “if only we could stop foreign investors realising the level of profits they do, we’d attract more investment” ?!? When I talk to companies and investors about the factors they consider in investing in a country, they talk about hurdle rates and the cost of capital, risk adjusted return, political risk, sovreign risk etc… but I haven’t heard them say ‘there is a really attactive investment opportunity in X country, but we are not going to go for it because the only free cash we have is in an offshore investment hub’. 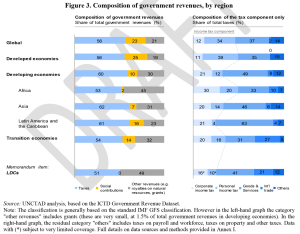 The thing I take away from the UNCTAD report is just what a small sliver MNE related corporate income tax is overall, in relation to overall tax revenues (3%). There is a striking gap between UNCTAD’s assessment that international tax avoidance is worth an additional 1.5%, and the popular perception that this is a huge amount that could solve problems in provision of education, health, infrastructure etc… This must be surprising information for many? … and bears more talking about – as the report says; more nuanced debate about trade-offs and investment policy. Thanks Maya. I must confess to having a little chuckle when I read the paper, for the reason you allude to at the end. On the one hand, UNCTAD provide an additional strand of evidence for the broad scale of revenue impacts ($100bn+) that has been suggested by NGOs and others for a good few years now (although of course this is complementary rather than a perfect substitute). On the other hand, it also highlights how small this sum of money this is in relative terms – so that those who have questioned previous estimates may well wish to focus on this aspect instead! ii. the importance of this as a single revenue source is relatively small, so while the distributive implications of failed international tax rules make a powerful case for prioritisation, it should be as part of, rather than in place of, a broader tax justice concern. sorry to admit, these numbers need more time to think about than I have at the moment. just looking down at the is $100bn big? question, as always, it depends which countries we are talking about. a very interesting summary. I tried to follow your link above to the report but it didn’t work. Could you update the link or send me a copy of the report?